DENVER, March 20, 2017 /PRNewswire/ -- DaVita Kidney Care, a division of DaVita Inc. (NYSE: DVA) and a leading provider of kidney care services in the United States, today celebrates Allen R. Nissenson, M.D. 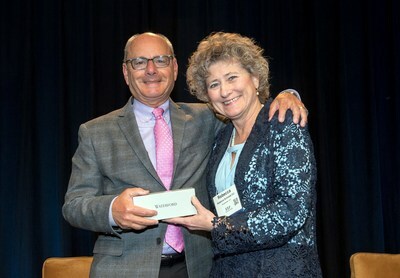 FACP, chief medical officer for DaVita Kidney Care, for receiving the Distinguished Nephrology Service Award from the Renal Physicians Association (RPA) at its annual meeting last Friday. "I'm deeply honored to be recognized by my peers for my work in nephrology," said Dr. Nissenson. "It's truly fulfilling to have a career where I have been able to help the incredible patients with kidney disease who fight so hard every day to lead the lives they deserve." The Distinguished Nephrology Service Award is presented to an RPA member who has contributed to nephrology in the field of socioeconomics or clinical practice, and who has impacted the clinical care of kidney patients. The recipient has been nominated by fellow members, and nominations are based on a member's demonstration of local and/or national leadership that is aligned with the RPA's mission and goals. Dr. Nissenson has been an RPA member for over 25 years. He has previously served as President of the RPA Board of Directors and in many other RPA leadership positions. Dr. Nissenson became DaVita's chief medical officer in 2008 and has since led the company's clinical strategy to improve patient outcomes and health-related quality of life. He has developed several key programs that have contributed to DaVita's ability to improve its clinical outcomes, including the Patient-Focused Quality Pyramid, which was published in the Clinical Journal of the American Society of Nephrology and has been widely embraced by the kidney care community as well as the Center for Medicare and Medicaid Services (CMS). To learn more about Dr. Nissenson or other physicians who work in the Office of the Chief Medical Officer at DaVita, please visit DaVita.com/Physicians.